Shanghai - Ferrari's Charles Leclerc is gunning for his first win this week in China after cruelly missing out in Bahrain as Formula One's 1000th race coincides with the emergence of a bright new star. The Chinese Grand Prix is replete with sub-plots: can Hamilton win the race for a sixth time? Can Sebastian Vettel silence the doubters? How much faster are Ferrari? But the focus in Shanghai will be on Leclerc, the Ferrari rookie from Monaco who fully deserved victory two weeks ago but had to settle for the first podium of his career. Sometimes, it is just not your day. Today it was not ours but I'm so proud of my team. They gave me an amazing car all week-end long and we'll come back stronger, I'm sure ?? "Usually the Chinese race is good fun because the weather can be unpredictable and rain can arrive when you least expect it," said Leclerc. "It's the 1000th race in the history of Formula One and I hope the car will be as good as it was in Bahrain (until late on) so that I can continue to go for the results we deserve." Shanghai has one of the longest straights in the 21-race championship and should be perfect for Ferrari's searing pace, with reliability the main concern for the Italian marque. While there has been fulsome praise of Leclerc, particularly the mature way he handled the Bahrain disappointment, his Ferrari team mate Vettel is facing criticism. Former F1 driver Jolyon Palmer, who left Renault during the 2017 season, called Vettel's spin in Bahrain -- where he was duelling with Hamilton - "amateur". "If a backmarker rookie had spun in the manner Vettel did, they would have been a laughing stock after the race," Palmer told the BBC. "For a four-time world champion to do so should be unthinkable." With all the talk about Ferrari, it is easy to forget that Mercedes won the opening two races. Valtteri Bottas claimed a dominant victory in the season-opening Australian Grand Prix with world champion Hamilton second. It was the other way round in Bahrain, leaving the Finn a point ahead of the Briton in the early drivers' standings after picking up the fastest-lap bonus point in Melbourne. "The truth is that we weren't as quick as our direct competitors throughout qualifying and the race in Bahrain," he said. "The Ferrari was considerably faster on the straights and this added up to several tenths around one lap. "The challenge we are facing doesn't daunt us, it's uplifting," he added. Being able to say they triumphed in the 1,000th race is added incentive for all drivers and teams. 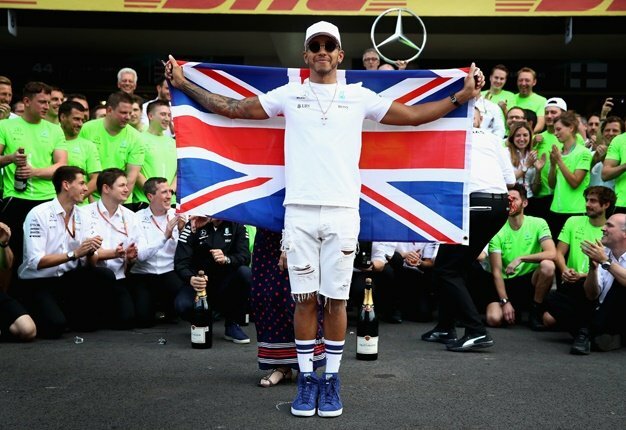 F1's first championship race was at Silverstone, England, in 1950 and it says much about how the sport has grown that its milestone grand prix is in China. The country, which has a swelling number of motor sport enthusiasts, is a key market for F1's US-based owners Liberty Media. Liberty Media say they are interested in holding a second grand prix in the world's most populous country.